A new BACnet ‘’VAV’’ controller is now available to complete STRATO’s line (STRATO Automation). This new BACzone 424 use a high precision hot wire velocity transmitter (new dust segregation technology). This BACzone is an incredibly powerful variable air volume box controller. It is entirely programmable and offers 10 physical control points that are completely free for all uses (4 analogue inputs, 2 analogue outputs and 4 binary triac outputs. For improved control, the BACzone is equipped with an advanced technology velocity transmitter that scales two combined readings. The controller provides a very rapid response to changes at low flow levels, where most applications for this type of controller are used. See more details at http://www.stratoautomation.com/en/products/sheet/?pid=9. The new released BACnet Virtual Thermostat from Chipkin Automation Systems can send commands to a controller using BACnet Ethernet/IP/MSTP. 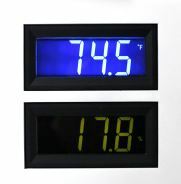 The thermostat can be used without input as a temperature controller, or it can be used as a fully functional thermostat as it accepts inputs from other BACnet capable devices or from a PC connected sensor. Features: • It is easy to install, configure and use. • The buttons, date and other display elements are configurable. • Corporate branding with logo or stream images/forecasts from a web server. • Minimizes to an editable icon in the system tray with configurable mouse-over display. The second generation Viconics VWZS Wireless Zoning System has been specifically designed to bring a simple scalable wireless zoning solution to the commercial midmarket without the cost associated with a typical DDC zoning system. Our zoning system now provides even more flexibility by offering additional functionality and new models covering more applications while still achieving excellent energy savings. The new central models include rooftop and heat pump units controlling analog heat, CO2 levels and indoor air quality in conjunction with zoning controllers that provide floating and analog damper control. 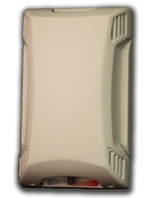 The most unique feature of the zoning system is its scalability; a single central controller unit can support up to 100 individual zone controllers. ACI has designed a new option for your standard wall-mount sensor applications. It is stylish yet understated. The main focus of the redesign was to have a fresh new look yet still be unobtrusive. It would also have to be flexible in design to accommodate several different sensors and sensor options. One key aspect behind this project is that we did not want to outsource any part of it overseas. The new enclosure, including supportive materials, was designed and manufactured locally. It should provide our customers a fresh new look to propose to their clientele. The new look is so unique that ACI will have a design patent on it! Also, there is the option to add your logo which can enhance your company’s exposure as well. Setra Systems, Inc. (www.setra.com), a leading global designer and manufacturer of pressure measurement instrumentation for industrial, test & measurement, HVAC/R, semiconductor, energy, environmental, medical, pharmaceutical, and meteorological requirements, has introduced its Remote Measurement Display, allowing for clear and remote viewing capabilities of real-time “at a glance” HVAC/R conditions, ensuring effective climate control management within a variety of critical environments. 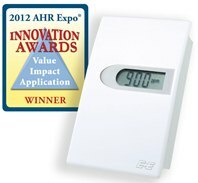 As the most innovative product in the category "Indoor Air Quality", the wireless transmitter EE245 from E+E Elektronik was honored with the "2012 AHR Expo Innovation Award". As the jury of this prestigious award is composed of renowned ASHRAE members, this award is a special confirmation and motivation for future developments for the sensor specialists at E+E Elektronik. The valuation of all submitted products was based on objective criteria: innovation, usability, assessed value for the customer and market impact. The combination of high-end sensors for humidity, temperature and CO2, as seen in a sleek design with the use of advanced wireless transmitter technology was seen as a special feature of the EE245 by the jury. The user saves time and money by eliminating expensive wiring and gains flexibility in the selection of appropriate measurement locations. The entire wireless transmitter EE240 series also boasts having a very simple configuration of the entire network via a standard web browser without requiring any additional software.